The process, which forms chrome car accents or gold-plated jewelry, is currently being applied to the making of powerful lithium-ion batteries. A team of researchers from the University of Illinois, Xerion Advanced Battery Corporation and Nanjing University in China formulated a technique for electroplating lithium-ion battery cathodes, producing superior quality, high-performance battery materials that could also pave the way for flexible and solid-state batteries. 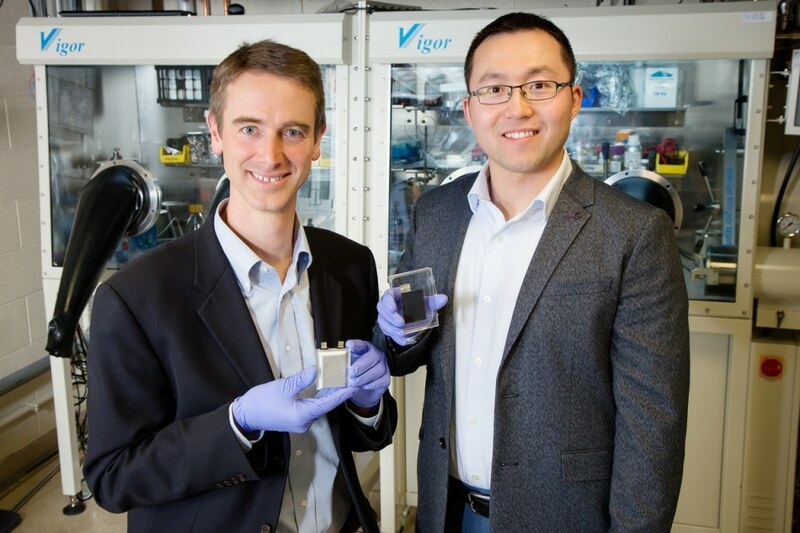 This is an entirely new approach to manufacturing battery cathodes, which resulted in batteries with previously unobtainable forms and functionalities. The conventional lithium-ion battery cathodes use lithium-containing powders produced at high temperatures. The powder is mixed with glue-like binders and other additives to form a slurry, which is coated on a thin sheet of aluminum foil and dried. The slurry layer has to be thin, so the batteries are restricted in the amount of they can store. The glue also restricts performance. The glue is not active. It doesn’t contribute anything to the battery, and it gets in the way of electricity flowing in the battery. You have all this inactive material taking up space inside the battery, while the whole world is trying to get more energy and power from the battery. The powder and glue process was completely sidestepped by the researchers by directly electroplating the lithium materials onto the aluminum foil. As the electroplated cathode does not have any glue occupying the space, it packs in 30% additional energy than a conventional cathode, according to the research paper. It can charge and discharge quicker as well, as the current can pass directly through it and not have to steer around the inactive glue or via the slurry’s porous structure. It also has the benefit of being more stable. Furthermore, the electroplating process produces pure cathode materials, even from impure starting components. This means that manufacturers can use materials lower in quality and cost and yet attain an end product that is high performance, preventing the need to use expensive materials already brought up to battery grade, Braun said. “This method opens the door to flexible and three-dimensional battery cathodes, since electroplating involves dipping the substrate in a liquid bath to coat it,” said co-author Huigang Zhang, a former senior scientist at Xerion who is currently a Professor at Nanjing University. The team tried out the technique on carbon foam, a lightweight, inexpensive material, creating cathodes that were a lot thicker than conventional slurries. They also demonstrated it on surfaces and foils with different shapes, textures and flexibility. These designs are impossible to achieve by conventional processes. But what’s really important is that it’s a high-performance material and that it’s nearly solid. By using a solid electrode rather than a porous one, you can store more energy in a given volume. At the end of the day, people want batteries to store a lot of energy. The U.S. Department of Energy Office of Science supported this research at the University of Illinois. Materials Science and Engineering Professor Jian-Min Zuo also was part of the Illinois team.